A surprisingly upbeat and enthusiastic group of architects, developers, builders and designers packed the Palmer House Hilton for the Chicago Architecture Foundation's Burnham Centennial Ball on Saturday night. With nothing but optimistic things to say about the economy, they gathered to salute Daniel Burnham's 1909 Plan for Chicago, and an individual and a corporation for their commitment to the Plan's theme of civic-mindedness, beauty and optimism. 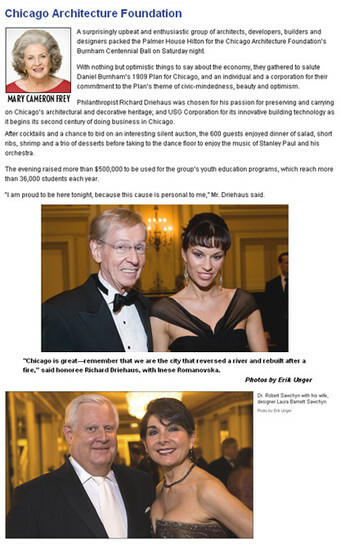 Philanthropist Richard Driehaus was chosen for his passion for preserving and carrying on Chicago's architectural and decorative heritage; and USG Corporation for its innovative building technology as it begins its second century of doing business in Chicago. After cocktails and a chance to bid on an interesting silent auction, the 600 guests enjoyed dinner of salad, short ribs, shrimp and a trio of desserts before taking to the dance floor to enjoy the music of Stanley Paul and his orchestra. The evening raised more than $500,000 to be used for the group's youth education programs, which reaches more than 36,000 students each year. "I am proud to be here tonight, because this cause is personal to me," Mr. Driehaus said.